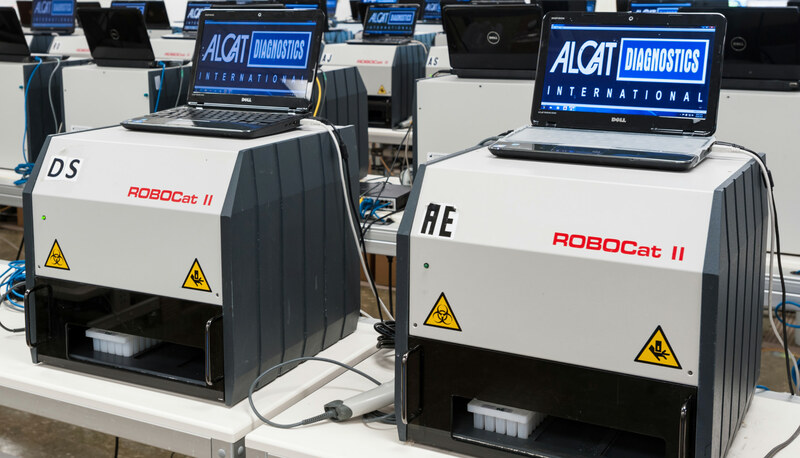 The ROBOCat instrument employs the electric sensing zone method of particle sizing to create a size/volume distribution curve, or histogram, for each sample. This method of determining the cell volume and count is the international standard for the automated analysis of cells. (Show actual micrograph of cells passing through electrical field. Simply put as the blood cell flows through a sensing zone, the resistance will change in proportion to the cell’s content. The systems processors will capture the change and express it as a pulse where its amplitude is directly proportional to the cell’s volume. The electronic circuitry of the instrument is also able to count all of the cells, within the various size ranges and creates the size distribution curve, or, histogram. This instrument is designed by our own team of engineers and manufactured in our ISO certified and FDA registered facility following Good Manufacturing Practices. The instrument has been cleared by the European Union and various other health ministries around the world. Our dedicated engineering and design department is focused on process improvement and innovations that serves to improve our technology and functionality.